North Geelong celebrated its selection for the Victorian Premier League with a three-nil win over Bell Park in the Diversity Cup at Elcho Park on Friday night. Corio also won its second round match with a three-two victory against Geelong. Corio and North had shared the points in their opening fixture so for both clubs it was important that they got a win. North struggled against Provisional League side Bell Park in the first half and there was no score at the interval. Michael Anderson and Ross Wallis both struck the woodwork for North, but Park also had its chances when Nathan Havenus and Julian Barbagallo had good openings which they both were unable to convert. The second half was only six minutes old when North broke down the right wing and Anderson finished from close range. Five minutes later North’s Vito Clemello was sent off for dissent, but the remaining ten men went further ahead a couple of minutes after that. Again the ball was moved swiftly down the right flank and though the first shot on goal was blocked, Anderson pounced to score from even shorter range. Bell Park’s best response came on the hour mark with a sweeping move from deep in defence to the edge of the North penalty area, but when the final shot flew over the bar, Park’s chances went with it. Reardo Luka, who had a fine game for North, added a third goal with a couple of minutes left for play. 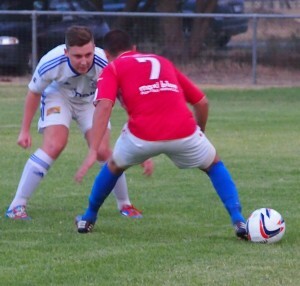 Does Reardo Luka (7) of North Geelong really know where the ball is? In the early game, Geelong started where they left off in their opening match by dominating the first twenty minutes against Corio. 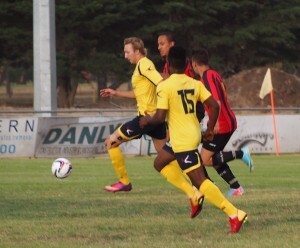 Matthew Sesay placed a free kick along the ground to Jordan Nelson who fired home past a sleeping Corio defence. Geelong could have been three up shortly after but Sesay had his shot saved after an excellent run from deep and Jasmin Ikanovic lobbed the ball over the Corio keeper but just wide of the goal. Geelong coach Ante Didulica said afterwards that the failure to take these opportunities let Corio back into the game and when Geelong lost the ball in midfield Vedran Stojanovic took advantage to equalise on the half-hour. Two minutes later Corio was in front as a cross from the right was met by Yianni Mantzaridis with a firm header which gave keeper Dylan Nikolovski no chance. Five minutes after the break Ikanovic made up for his earlier miss with a well struck free kick which found the net through a mass of bodies. Keeper Nikolovski injured his shoulder and had to come off with veteran Romeo Purlija taking his place. The match was heading for a draw when Stojanovic latched on to a long ball forward and ran on to give Corio a somewhat fortunate victory. Though as Robbie Noggler said afterwards, ‘The players stuck at it.’ But they did it the hard way. Corio’s two-goal hero Vedran Stojanovic (left) outstrips the Geelong defence, backed by winger Elton Savice (15). On Sunday night Geelong Rangers plays Bell Park at 7 pm, followed by North Geelong against Lara at 8.20 pm.